I was disappointed with this book by Philip Roth – it was not what I expected. I was looking forward to an alternative history political thriller, but instead was served with a detailed account of the life of a 1940s Jewish New Jersey family. The book posits the election of Charles Lindbergh, celebrity aviator, isolationist, admirer of Nazi Germany and anti-semite, as US President in 1940. The story is told through the eyes of an eight year old Newark Jewish boy. The life of the boy’s family is described in great, and for me tedious, detail. At times the writer’s voice sounds like an eight year old, which works well such as the boy’s fear and simultaneous fascination of seeing the stump of an amputee’s leg. But most of the time the writer is looking back retrospectively and this makes rather tiring reading. There is far too much detail, such as pages of description of wedding guests who play no further role in the book. The pace is very slow and it’s nearly half way through the book when we get to the first dramatic event. This is a family trip to Washington, with unpleasant scenes in a hotel and restaurant. The episode is very well described. But then the family returns to Newark and for much of the book nothing dramatic happens. The book convincingly describes tensions within the extended family as whether to collaborate, resist or flee. However these family arguments are just repeated in far too many scenes. Towards the end of the book nation-wide riots break out and the boy’s father has to make a dangerous cross country car journey. However the dramatic effect of this is spoiled by being told retrospectively. The ending, which conveniently lets real history reassert itself at the end of 1942 albeit a year late, was poor and lacked plausibility. I still haven’t finished, The Plot Against America, so I’ll pick a couple of sentences from a random page of a book I’m about to read. 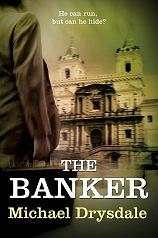 I’ve just started Giveaways of The Banker on Goodreads and Librarything. The Giveway competitions run until 12th June. For Goodreads there are 2 printed copies going. For Librarything I’m giving away 10 ebook copies. The Banker got a 5 star review a couple of days ago from a Goodreads member in Canada. The reviewer was one of two who received a copy of the book as part of my Goodreads Giveaway back in February. So the Giveaway has really been worthwhile.